Family holidays are great, full of love, happiness, and tradition. But, let’s admit it, they can be very stressful. If you still haven't experienced holiday-related stress, it probably means you don't have a big family, or at least you are not cooking for all of them. Now, the Easter is just around the corner, and I'm not even telling you how many eggs I need to prepare. Boiling that many eggs at once, without any of them cracking is almost impossible. Of course, boiling them is just the beginning, then comes the dying, decorating and everything else. That's how I came to an idea of buying the egg cooker. Why wouldn't I make things easier for myself if I can? I'll need an egg cooker that can cook a lot of eggs at the same time and that has useful features for other purposes besides boiling. So, after I've tried five of them and made my decision, I decided to share my experience with you. What is the Egg Cooker? How to choose the most eggsquisite Egg Cooker? Egg cookers or egg boilers are small electric devices, mainly used for making breakfast. They have enough space for boiling several eggs at the same time. The most important thing is, every egg has its separate station which means they are not bashing against each other. Another useful feature is that there's no need for waiting for water to start boiling. Eggs start cooking instantly, and the amount of used water is just here to determine eggs hardness. When you buy an egg cooker, you usually get a measuring cup with it. This cup is used for calculating needed amount of water, based on the number of eggs you are cooking and desired level of firmness. Egg piercer or egg pricker is also often provided with egg boilers. You'll need to pierce all eggs (on the wide side) before placing them on the rack, to provide an escape route for air. This way you'll get eggs with the smooth rounded end. Egg cookers can hard boil, soft boil, poach your eggs or even prepare an omelet, by using heated water and steam. As I already mentioned, the amount of water needed depends on desired hardness. Consequently, required time of cooking depends on the amount of used water. When you hear the beep sound and see the light indicator go off (if there is one), you'll know that water is completely evaporated and the cooking process is done. After the eggs are ready, the recommendation is to place them in cold water. This will stop the process of cooking within the egg, prevent it from overcooking and turning all greenish. Deciding on the perfect egg cooker for yourself depends chiefly on your wishes and needs. However, cookers do come in all sort of varieties. The first thing you need to ask yourself is how many eggs you want to cook at once. Electric egg boilers can usually handle between six and ten eggs at one cycle, but there are also small cookers for only one or two eggs. As I have a big family and I am purchasing an egg cooker for Easter purposes, I need a one that can cook a large number of eggs. If you don't eat more than two eggs at once, a smaller cooker would be a better investment because it would save you energy. As I mentioned previously, I am looking for a cooker with various features. By that I mean I would like not only boiling and poaching options but the option to make omelets. Take a good look when you are buying, because not all egg cookers have this option. Besides the omelet making, egg cookers can offer you an auto-off feature, audible alert when the cooking is done and option to keep the eggs warm for a longer time. Also, some cookers have dishwasher safe parts, while some need hand washing. These are all useful characteristics you should consider before buying. Last but not the least is manufacturer's warranty. Warranties usually vary from 90 days to three years, so take that into consideration combined with the price of the product. The whole time I was writing this review I was referring to this appliance simply as an egg cooker. So, just in case you get confused, I meant electric egg cooker. Microwave egg cooker is something entirely different from what we are talking about. It is usually made of plastic, and it's an egg-shaped container that has a bowl where you pour the water, a rack for eggs on top of that and the cap. It gives the same result, but you need to put it in the microwave and heat it that way for some time to get the eggs done. However, if you are never sure how much time you need to cook your eggs on the conventional stove, the microwave cooker won't help you much. On the other hand, electric egg cooker's main purpose is to solve this problem. 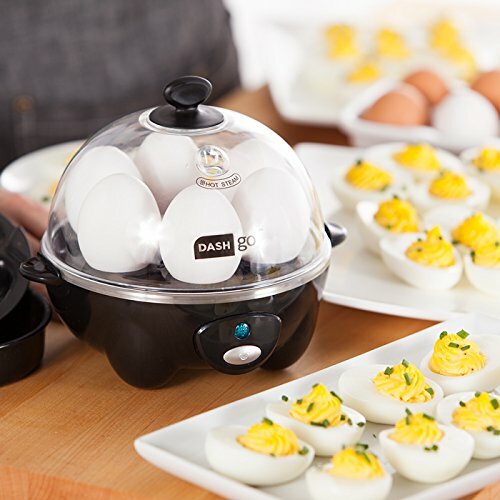 Dash egg cooker can boil six eggs at once. It makes omelets as well as poached and scrambled eggs. It is very simple to use. You just need to fill the measuring cup to the line of desired consistency, push the “on” button and wait. After you hear the buzz the job is done. And you will hear the buzz for sure because it rings on and on until you don’t plug out the cooker. Another flaw is that when the buzz starts ringing, the cooking process doesn’t stop, so if you don’t stop it manually, you may end up with overcooked eggs. If you plan on making an omelet or poached eggs I recommend you use a little non-stick cooking spray. It is not necessary, but it’ll help the eggs come out easier. What I liked is that all the parts which need to be washed are dishwasher safe. You may notice the bottom metal starting to look rusty after few uses. This is nothing to worry about, that is not rust but sediment that comes from the eggs or out of the water you use. I usually solve this problem by pouring vinegar into the bottom of the boiler, and I leave it like that for a few hours. Then I dump the vinegar, wipe it with the paper towel and proceed the usual way of cleaning. For your money, you get a solid, dishwasher-safe product with one-year warranty. Also, this boiler is easy to store, and it fits even the smallest sized kitchens but has an alarm that will wake up your whole neighborhood. Non-electric parts are dishwasher safe. It comes with the recipe book. The buzzer is too loud and won’t stop until you turn it off. It doesn’t have an automatic shut off. The tray is not very stable; eggs may tremble. You may burn your fingers on the lid. 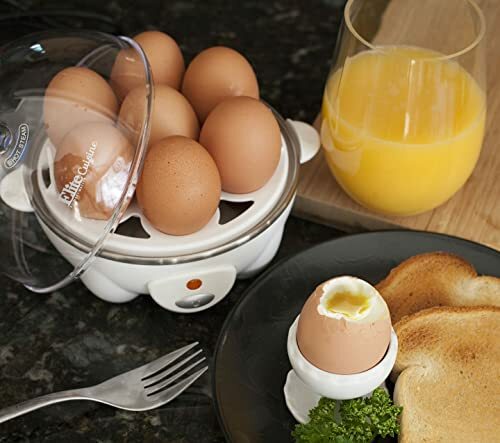 Elite Cuisine egg cooker will boil up to seven eggs for you. You can also use it for poaching and make an omelet. The buzzer was the problem in a previous cooker, but here we have another extreme. This one has no alarm at all. It has an indicator light so you can see when it’s working, but if you want sound notification, this one is not for you. However, this is not a big problem because the cooker shuts off automatically, so you can do something else and get back to it after it’s done and there would be no harm. If you plan on making an omelet or poached eggs, my advice stands for this one too. Use the non-stick spray or coat the pan with olive oil if you want your eggs to slide off to your plate easily. Also, the manufacturer recommends using the distilled water to avoid the stains and discoloration. In case you forget to buy distilled or you have to use regular water, cleaning with vinegar will do the trick. I usually lose small kitchen gadgets, so I was happy to hear that this one has a piercing pin built into the measuring cup. Considering the measuring cup, I noticed the printed lines start to wash off so you may need to draw them yourself again. Watch out for your hands. I’ve accidentally put my hand over the steam release hole on the lid, and I burnt myself. In conclusion, for a small amount of money, you’ll get a quiet, fast and efficient product that shuts off automatically and boils up to seven eggs. Cooks up to 7 eggs at once. Measuring cup has a built in piercing pin. No alarm when it’s done. Lines on the measuring cup start to wash off after few uses. Extra large eggs won’t fit in the cooker. Measuring cup doesn’t consider the number of eggs. I was very careful with trying out this model because many people told me that previous versions had the leak problem and all sorts of troubles, but this one was supposed to work differently. After the first use, Cuisinart egg boiler made me so happy! It cooks ten eggs at once, which is the most important feature for me. The poaching tray has a four egg capacity, and the omelet plate can take only three eggs. This is too small for me because I never cook only for myself. However, in comparison to previous two, this model has a light indicator and an audible alarm which is not too loud. When it beeps, you should pay attention to it, because it doesn’t have the proper auto shut-off option. It shuts off when it’s done, but it turns back on if it starts cooling down. With this egg cooker, the amount of water you put inside isn’t closely related to the number of eggs you’re cooking. You should always get the expected result. 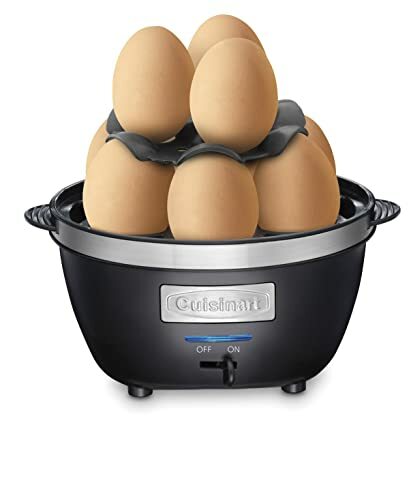 Cuisinart egg cooker has a heavy cord which may cause a difficulty with leveling your appliance, but when you do it a few times and get used to it, it shouldn’t be a problem. Also, the machine has a built-in cord storage, which is perfect for storing and cleaning purposes. You may need to invest a little more money if you plan on buying this product, but you’ll be able to prepare more eggs and have optimal alarm loudness. The good thing is that it comes with a well-written instruction book and everything should work properly if you follow it. Easy to set up and easy to clean. It has LED indicator and audible alert. The number of eggs inside is irrelevant to the water you put in. The electric cord is heavy. It doesn’t have the auto shut off option. 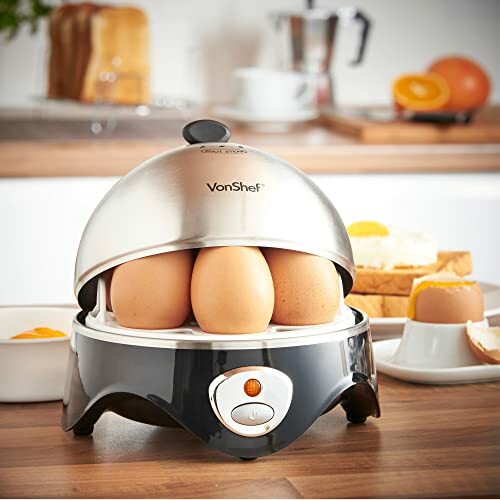 VonShef Electric egg poacher boils up to seven eggs and comes with no audible alarm. If you like the silent cookers, this may suit you, but I like to be notified when the eggs are done. However, it has a light indicator, and it turns off automatically, so it won’t be a problem if you just leave it working for a little longer. This model has a stainless steel lid and heating tray, which means the tray needs a little more time to cool down, and you can’t see your eggs while they are cooking, but it has a sophisticated design. I’ve tried cooking jumbo eggs with this one and they fit in, which is good to know if you prefer that type of eggs. For me, a big con was that measuring markings on the cup are hard to see and a bit confusing. They are presented as drawings of one, two and three little eggs, and it’s not clear what they should represent. So, it takes some time to get used to them. The switch seems not to work, at least on the one that I’ve tried. You plug the cooker in, and it starts heating immediately. So, buy that logic it is safer to plug it out when it’s finished, better than to risk some accident. If you buy this product, you’ll get a quiet, small, beautiful appliance. You’ll spend less money, but you’ll have to hand wash it, and you won’t be able to make an omelet or scrambled eggs with it. Automatic turn-off and over temperature protection functions included. It has a stainless steel lid and heating tray. It can cook jumbo eggs. Measuring markings are hard to see. It turns on when you plug it in, without pressing the “on” button. If you want to turn it off, plug it out. 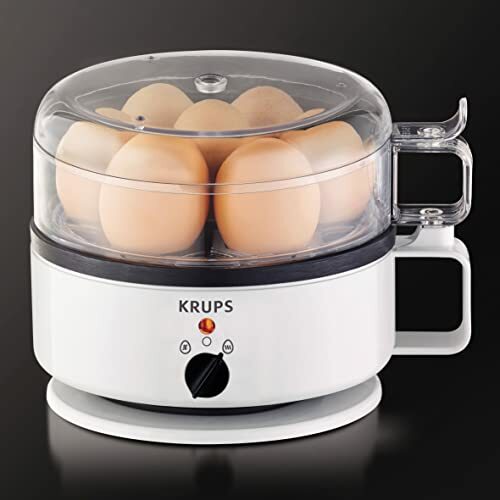 KRUPS egg cooker boils up to seven eggs at once, and it comes with a two-year warranty. It makes soft, medium and hard boiled eggs as well as omelets and poached eggs. However, before you use poaching or omelet tray, make sure to coat them with oil or use a non-stick spray, because they are the stickiest I’ve tried so far. Again, this one has a loud, annoying buzzer and doesn’t shut off automatically after it’s done. Still, it has a dual switch which allows you to set it on boiling or “keeping warm” mode. Another benefit is that both top and bottom part of the product have separate handles, which don’t heat up with the rest of the appliance. The egg holder is removable so you can cool eggs quickly by putting them under the stream of cold water or storing them in the fridge. All non-electrical parts are dishwasher safe, so the cleaning is super easy. Measuring cup on this one is not confusing as previous one, but it’s a little hard to read. It may not be the problem for younger generations, but when you come to the certain age… Well, you all know what happens, so I need bigger and bolder signs on measuring cup. You may spend a little more money on this loud appliance, but it’ll probably pay off because of the two-year warranty and all the useful features. I particularly liked the separate handles which made the product more ergonomic than any other in this review. Dual switch – boiling or just keeping warm. The measuring cup is a little hard to read. After the careful consideration, I decided that the winner is Cuisinart egg cooker! As I earlier mentioned the most important feature to me was the number of eggs that can be cooked at once. Well, Cuisinart egg boiler cooks ten at once, which means I’ll be done with boiling in seven rounds this Easter. Also, what I liked about this one is that has an audible alarm that is not too loud, and it has a light indicator. Lack of the auto shut-off option is a little inconvenient, but many others don’t have it as well. In conclusion, my opinion is that this egg cooker gives the best value for money invested. If you don’t need that many eggs boiled at once, I recommend you to consider all of the options one more time, there are some reliable products I didn’t choose solemnly for this reason.